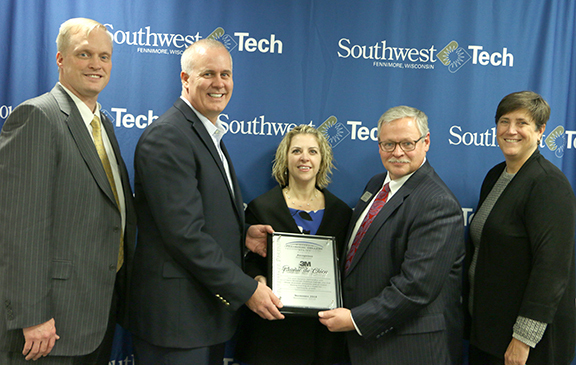 The Wisconsin Technical College System (WTCS) Board and Southwest Wisconsin Technical College (Southwest Tech) honored 3M Prairie du Chien on Tuesday evening with a ‘Futuremaker Partner’ award. Among other efforts, the partners have collaborated on the “Grow Your Own” workforce initiative, developing mentoring and internship opportunities that promote career awareness for students and create a talent pipeline for employers. Under its global Commitment to Education initiative, 3M Corporation partners with schools, universities and community organizations to ensure students and teachers have the tools, resources and knowledge they need to succeed. Locally, 3M Prairie du Chien has long been a champion of Southwest Tech and its students and graduates. It is committed to increasing student achievement in STEM and business curriculum, as well as attracting, retaining and developing students in other college programs. The company also promotes equity by driving access to quality education for all communities. “At 3M in Prairie du Chien, and with local industry in general, we see a gap between our needs and the qualified skilled labor pool, specifically in Electro-Mechanical Technology. Candidates need the general education, foundational knowledge, skills and abilities to maintain the high-tech, automated, smart technology equipment going into our manufacturing operations now and in the future,” said 3M Prairie du Chien Plant Manager Steven Kleist. “Partnering with the Prairie du Chien Area School District and Southwest Tech to create the programs and tools needed to ignite interest in smart technology and to recruit and develop highly qualified candidates is a wise investment in the future success of our operations,” Kleist said. This year, Southwest Tech collaborated with 3M and Prairie du Chien High School to establish the Grow Your Own sustainable workforce model. Focused on manufacturing careers, the model gives area high school students a chance to learn industry-relevant skills and principles that apply to a number of in-demand careers. In this way, Southwest Tech is helping bridge the gap between a retiring workforce and the next generation of highly-skilled technicians. Southwest Tech instructors work with high school teachers to assure academic rigor and valuable learning outcomes, easing students’ transition from the high school course to Southwest Tech’s Electro-Mechanical Technology program. In addition, 3M Prairie du Chien has committed to regional partnerships that provide career mentoring, internships and manufacturing career exploration. The work of these partners will not only sustain this program, it will help to drive long-term workforce and economic development. 3M Prairie du Chien offers scholarships to local high school students planning to attend Southwest Tech and consistently hires Southwest Tech graduates, while 3M team members serve on the Electro-Mechanical Technology program advisory committee and volunteer as robot competition judges. The Wisconsin Technical College System (WTCS) offers more than 500 programs awarding two-year associate degrees, one- and two-year technical diplomas and short-term technical diplomas and certificates. In addition, the System is a premier provider of customized instruction and technical assistance for Wisconsin employers. More than 300,000 people enroll at a technical college each year. Southwest Tech improves lives through excellence in learning and positions students for success in compelling careers and to be leaders in their communities. Through personal service and world-class teaching, the college is passionate about student success. In addition to academic programs that lead to certificates or degrees, Southwest Tech also provides customized instruction for local employers. Prairie du Chien is a premier 3M manufacturing facility and distribution organization delivering dependable, cost-effective products and services through the safe and environmentally proactive contributions of proud employees. 3M is a global innovation company that never stops inventing. Over the years, it has worked to improve daily life for hundreds of millions of people all over the world by making driving at night easier, buildings safer and consumer electronics lighter, less energy-intensive and less harmful to the environment. It even helped put a man on the moon.